The popular Disney Junior animated pre-school series Doc McStuffin will receive its own line of party supplies in May 2013. But, you don’t have to wait until then to have your own Doc McStuffins birthday party. This article will help guide you in putting together a Doc McStuffins birthday party including party supplies ideas, party games and party activities. If you liked the article or have some suggestions to add for a Doc McStuffins birthday party feel free to include them in the comments section below. 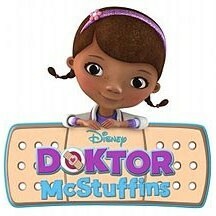 Dottie McStuffins is a six-year-old African-American girl that has a mother who is a doctor. This inspires the little girl as she fixes up toys and dolls and pretends to be a doctor. This is how she got the nickname ‘Doc’. During the 11-minute episodes, whenever she puts on her stethoscope the stuffed animals toys and dolls come alive. She makes them feel better by giving them check-ups with the aid her stuffed animals friends: Stuffy, a stuffed blue dragon; Hallie, a stuffed hippo; Lambie, a stuffed lamb; and Chilly, a stuffed snowman. The show can be viewed on the Disney Junior on the Disney Channel at 10am/9c and a second season was renewed. More information including fun games can be found on Disney’s Doc McStuffins website. Pink, Purple & White Decorations – The primary colors that Doc McStuffins wears are pink, purple and white which also make these colors perfect for the solid tableware, balloons, streamers and the tablecloth. Party Favors – Luckily, there are plenty of favors available that could work at a Doc McStuffins birthday party. There are plenty of stuffed animals available, which go along perfectly with the premise of the show. The kids could pretend they’re doctors, and their stuffed animal favors are the patients. Doc McStuffins Cake – Of course, the cake will do wonders for helping establish the Doc McStuffins theme since the Doc McStuffins themed party supplies are currently limited. For example, check out this wonderful Doc McStuffins cake over at Custom Cakes by Julie. Printable Invitations – For now, there are some Doc McStuffins printable invitations available. These printable invitations are available in pink, purple and blue. Doc McStuffins Reading – Doc McStuffins has her very own Little Golden Book titled “A Knight in Sticky Armor.” The book is perfect for not only getting the kids in the mood for a Doc McStuffins birthday party, but also inspiring them to read. Hunt-a-Potamus – This is a fun and simple game for ages 3 and up. Players try to find the hippo as fast as possible from various scattered game pieces, with the winner being the first to find the hippo. Although, the hippo isn’t purple like Hallie this game should work well for the younger kids. you can find it here: Hunt-a-Potamus. Doc McStuffins Coloring Pages – Kids love to color and there are a few official Doc McStuffins coloring pages available on Disney’s website. Make sure to grab some crayons for the kids so that they have something to color with. Have any ideas for a Doc McStuffins birthday party? Please share them!